I imagine a “polar vortex” to be a swirling mass of polar bears. Or some sort of high-powered polar bear business conference? Living in California, you see, comes with some benefits. Fresh oranges and avocados, sure, but also a lack of swirling polar bear activity. Or bracing cold, for that matter. I don’t mean to rub it in. I’ve seen the crazy, Day-After-Tomorrow/White-Walker-Winter-Is -Coming-Style photos of the rest of the country. New York looks miserable. Chicago? Forget it. Meanwhile, I ran outside this morning. In pretty much a t-shirt. In other news, I’m the worst. In other other news, I made you chili! 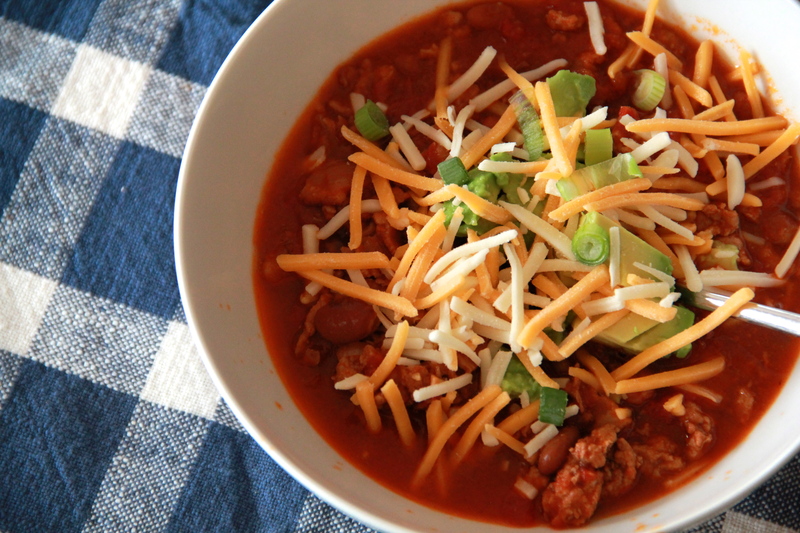 And as everyone knows, chili is where it’s at during a polar (bear) vortex. It’s a simple, one-pot, warm-to-the-bone kind of meal. It uses a lot of what may already be in your pantry. Plus there’s bacon! The smoky bacon is what starts us off, and then the chili fills out with ground turkey meat and some spicy chicken chorizo. Smoke and spice get topped with sweet tomatoes and rich beer, and some creamy beans, too. Top it all off with a handful of green onions and shredded cheese, a scoop of cool yogurt and some chopped avocado for good measure? CHILI TIME. With chips. Let’s see what our polar vortex has to say about that. In a large, heavy bottomed pot or dutch oven over medium-high heat, cook the bacon, stirring, until it just begins to brown, about 5 minutes. Stir in the onion and continue to cook until softened and translucent, another 5 minutes. Add the garlic and stir to combine, cooking for one minute, until fragrant. Add the chicken chorizo and ground turkey, breaking up the meat with a wooden spoon. Add the chili powder, cumin, paprika, cayenne and salt, and cook until the spices have bloomed and the meat is cooked through, 7-10 minutes. Add the crushed tomatoes with their juice, the tomato paste, beer and Worcestershire, stirring to combine. Bring the chili to a boil, then lower the heat and simmer, partly covered, for 30 minutes. Add beans and cook another few minutes, until everything is hot. Season the chili with more salt, to taste. 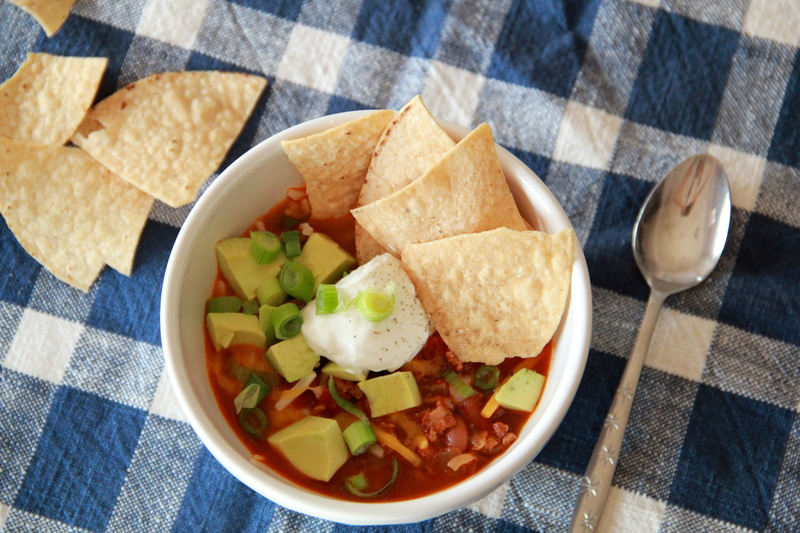 Serve chili in big bowls, with plenty of toppings on the side. Definitely been having serious chili cravings this winter. Can’t wait to try this! Polar bears and chili with bacon. Brilliant pairing. Yum! 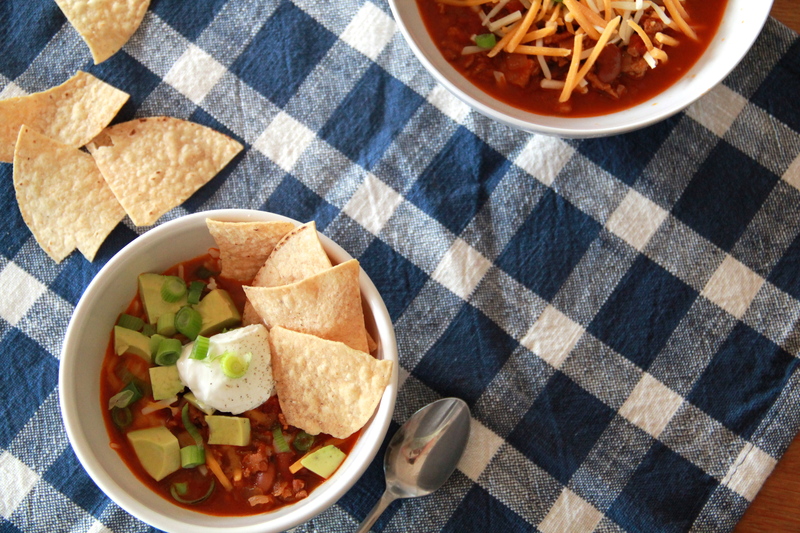 This may be the best chili ever…and I know my chili!!!! The Central NJ Chili Cookoff competition is coming up in February and this very well may be my entry! I look forward to cooking the smoky bacon turkey chili, but what can I substitute for the beer? Substituting broth – chicken or beef would probably be best – would be fine. Hope you enjoy!